Imagine getting to hang out with the brainiest, zaniest, most purpose-driven bunch of cool people just busting to get to know you, while having your mind expanded in new and unexpected ways with everything from new scientific miracles to timeless quiet reflection. Pshaw, you scoff? It’s all true. 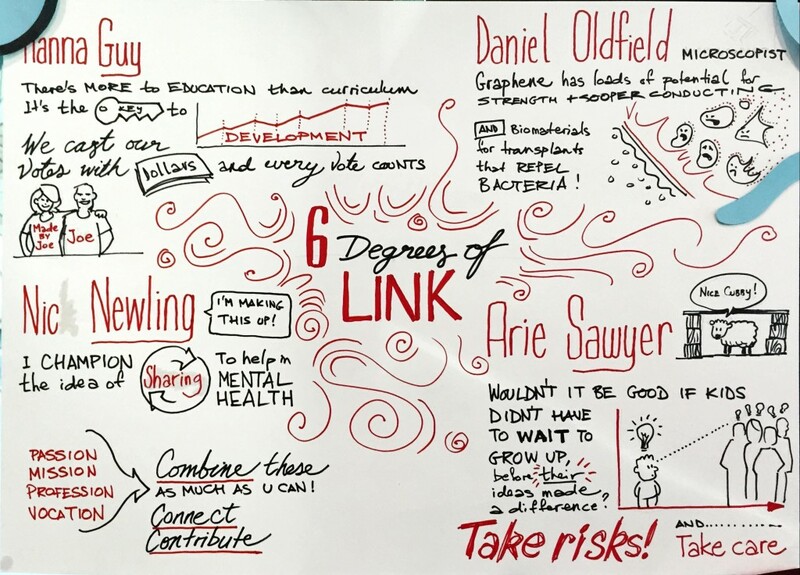 This was my life for 2 – oh so short – 2 days, as part of Link Festival 2016, a conference (ha, the mere word doesn’t come close!) 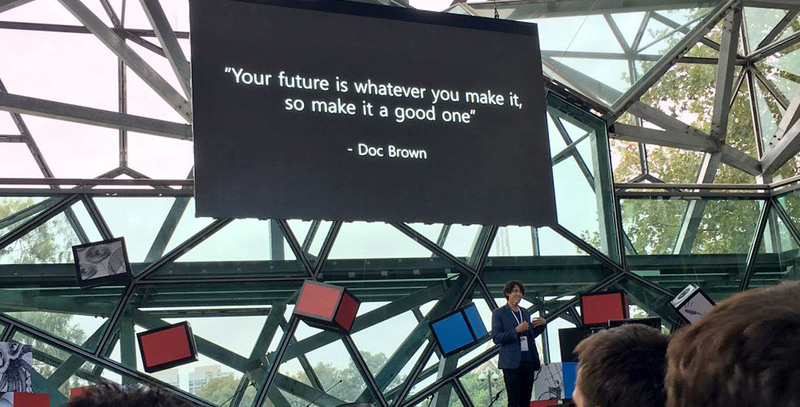 melding design, technology and social change, held by Engineers Without Borders and the ever-perfect Wildwon last week in Melbourne. Plenaries were hosted in the beautiful kaleidoscopic people-cage of Deakin Edge, with various break-out sessions, workshops and panels in the surrounding complex, in which to have your brain and heart amicably and expertly ruffled. And through it all, I sketchnoted as much as I could, sharing an art wall with the amazing and talented Devon Bunce from Digital Storytellers. 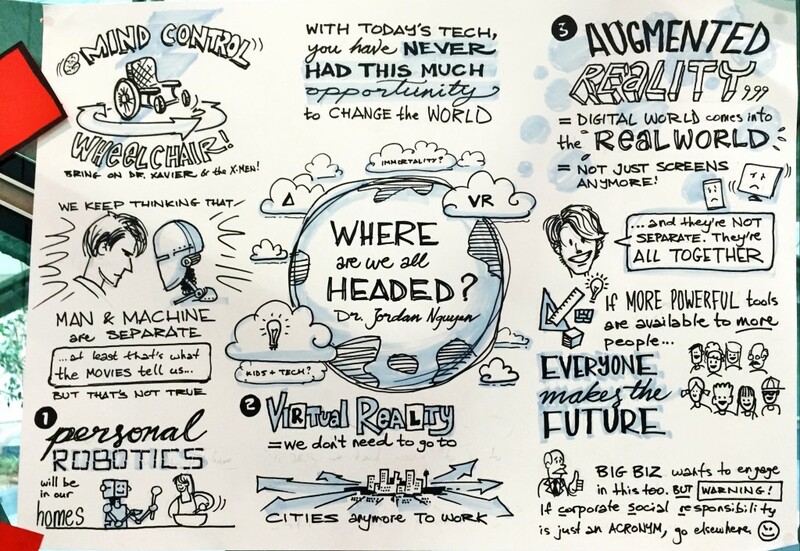 The first day kicked off with a lovely light romp through modern tech advances that signal the potential for various future trends, by all-round Nice Guy and Very Bright Sci-Preneur Dr Jordan Nguyen. Top fun to sketch this stuff. For me there was a lot of familiar topics, given I’ve just come off a vision project where I spent time looking at future trends, but the point about demystifying the role of robots and robotics struck a chord: robots will not take over the world, but they will take over our kitchens. 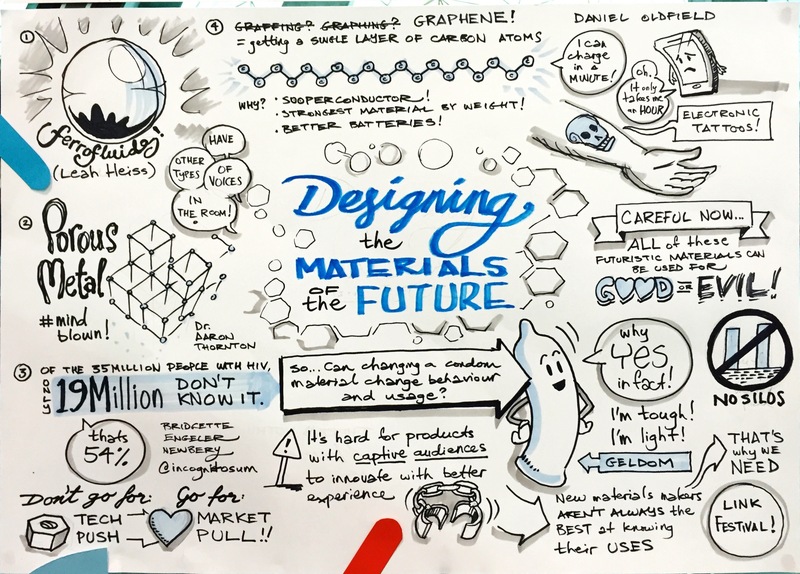 Eager for more insights into what design could be in the future, I headed over to listen to the panel speak on Design the Materials of the Future. OK, mind blown so much I forgot to sketch. I was rapt. Ferrofluids (brought to us by Leah Heiss) are intriguing, but the practical potential of porous metal structures (by Dr Aaron Thornton) was gobsmacking. The biggest insight for me from the ensuing panel discussion was that the designers and makers of these fantastic substances are just not the most qualified to know how best to apply them to the real world. Humility and prescience in action. Sure, they have a bunch of awesome ideas, but as I saw echoed several times throughout the 2 days, it’s about matching people with problems with others that have the nascent solutions. After a hearty veggo lunch (all catering was by Lentil as Anything again), I headed to a panel discussion for a personal favourite topic of mine: bringing the arts into STEM domains, or The Value of Steam. This one was a bit too much show-n-tell by each of the speakers, but I get that we all had to immerse ourselves in the various worlds of the arts, science, invention and education, for us to then be fully primed for the discussion afterward. There’s something a bit creepy about a large artwork made out of the cancer cells of a deceased patient… it feels like that sort of thing should belong in everyone’s darling gallery, the MONA. The big a-HA moment for me in the very brilliant discussion was that historically we have been trained to keep science and art separate, but both domains are creative in different and complementary ways; both set out to solve different sorts of problems, and both learn from each other. It’s a long road ahead when the very educational structures we have are passively keeping this divide. 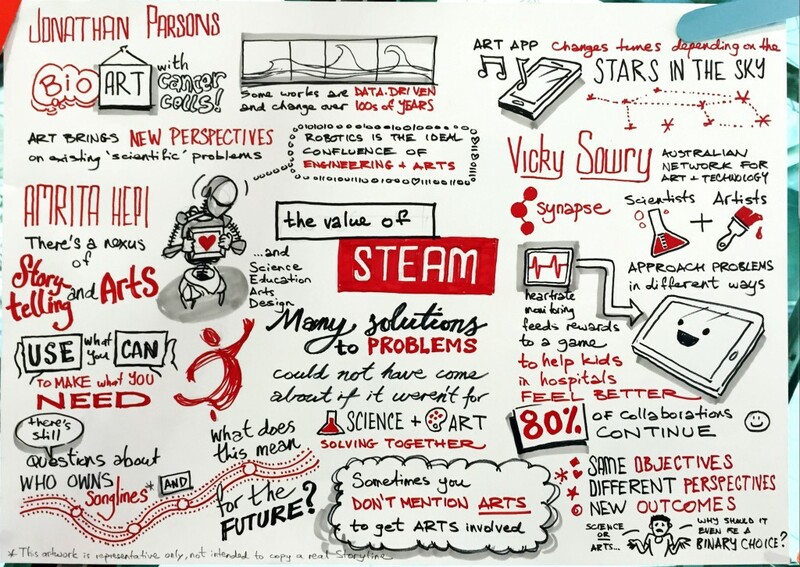 BUT there is hope; I had a top chat with Vicki Sowry (apols for misspelling your name in my sketchnote! ), and it turns out more and more universities are pioneering cross-faculty – er – faculties? that combine the good stuff from all disciplines, like the d.school (Institute of Design at Stanford). And so Day 1 drew to a feisty close with Misfits And Unreasonable People, brought to us by Kyra Maya Phillips and the frightfully candid Pamela Hartigan. My, how we all squirmed! at her cantankerous take on “giving back” and doing Masters in social entrepreneurship. Brilliant. As you can see, I took to the misfit stick-it-to-the-man theme of this session, and ended up graffiti-ing all over my own sketchnote. Take THAT. Er. Yeah. Yours truly gave a workshop session on sketching to explore, explain and envision. Around 60 people sketched along with me, as I went through some familiar material, as well as some new stuff looking at conceptual illustration. It was a delight and a privilege! Back in Deakin Edge, Michael Bones, Simone O’Connor, Koky Saly and Lucy Thomas took us up to lunch with their experiences on pushing for change in their chosen domains. This sketchnote isn’t my finest hour — I was pretty exhausted and distracted after giving my session. Biggest truth bomb for me: we have to stop assuming that big worthy ideas only come from Educated Grown-ups. Given the free-wheeling nature of kids, and given that more and more digital tools are accessible to more and more younger folk, we can and should expect more robust ideas and prototypes from people who haven’t even finished primary school yet. Be scared. But embrace it. 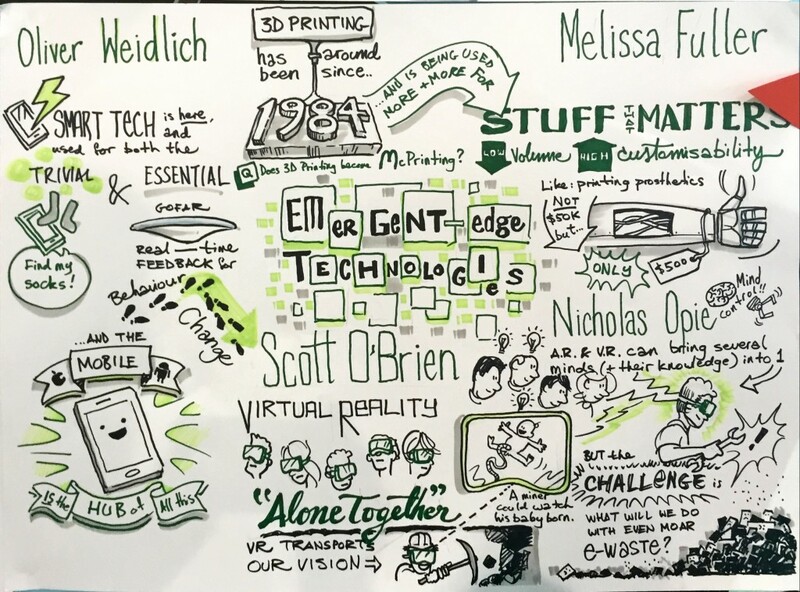 The next session I sketchnoted was titled Emergent-Edge Technologies, where I’ll forever cherish and save the best little Impressive Fact to come out with at the next meetup I go to: did you know that 3D printing has been around since 1984? I know, right? I personally think that when 3D printing goes mainstream we’ll have even more landfill on our hands as thousands of people from Wangaratta to Woolloomooloo print their own shoes, stormtrooper helmets and whatnot, thinking it’s oh-so-groovy, only to find that the plastic is kind of icky and dull. And not that durable, either. BUT hearing the dulcet, smooth and very knowledgeable tones of Oli Weidlich from Mobile Experience brought gravitas to the room, and warmth to my bitter jaded designer heart. And so, the moment that I’d all been waiting for came upon me: hearing Dr Jason Fox. Yes, Dr Jason Fox, author of The Game Changer and How To Lead A Quest. Author of the best e-newsletters — yes you read that right — of all time. The Thinking Man’s Motivational Speaker. A true titan in the realm of creativity, business canny, and sartorial grace. And I got to just sit there, listen, immerse, and draw. Honestly, the sheer amount of amazing wisdom and whimsy that flowed forth was just completely unfair, but oh we all revelled in it! A big meaty a-HA for me was that collaboration at work is an infinite game. It can’t be thought of as having an end point — that’s an illusion — and as such it should be designed like every other infinite game: with goals, rules and feedback along the way. These mirror Dan Pink’s principles of purpose, mastery and autonomy respectively. 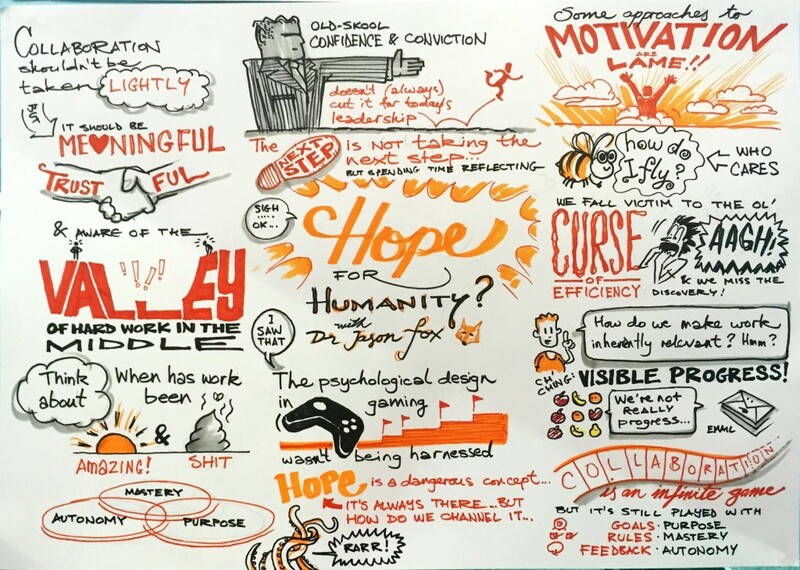 Of course this sketchnote doesn’t come anywhere NEAR doing his plenary justice; I used up so much room just capturing golden nuggets from the banter with Nathan Scolaro from Dumbo Feather before things really got underway. If nothing else, I hope this sketchnote leaves you — as Dr Fox left me — merely hungry for more! Beautiful work Ben, thanks for sharing your talent and inspiration. Felt like I was there (wish I was!). Cheers!